It looked as if Joey Giardello was going to "blow" a shot at the world's middleweight crown in the Arena ring last night. Actually, Philadelphia's hope for the 160-pound crown didn't start finding the range against Ralph (Tiger) Jones until the last two heats of their 10-round affair. 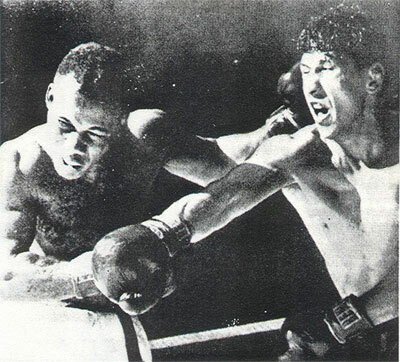 Joe fought in flurries through the first eight rounds and on occasions let Jones take the play away from him. He stayed close enough to make a good fight of it and then began landing with short left hooks and right crosses to Jones' face and mid-section. Some of the 1,833 fans, who paid a gross gate of $6,294.50, didn't agree with the unanimous verdict given Giardello. They went along with the underdog. But Giardello came with a rush in the ninth and tenth, especially the latter round, as he slowed up his rival with some telling wallops. Several times during these two heats he had Jones set up for the finishing blow but "The Tiger" was a tough hombre and fought back tenaciously to throw a real scare into Giardello's corner. Joey had to whether an early storm for he suffered a cut on his left eyebrow in the third round and blood began streaming down his cheek. It wasn't deep enough to be real bothersome and Jones wasn't able to open it deep to perhaps force a halt to the proceedings. So, Giardello stalked Jones until he found his target in those last two rounds. One judge, Max Daroff, gave seven rounds to Giardello, two to Jones and called another even. The other judge, Nate Lopinson, called it 6 to 4 in Joey's favor and the referee, Pete Pantaleo, decided it the same way. The fight which really brought the crowd out of their seats was Jimmy Soo's sensational finish against Howard (Moony) Curry as the Chinese-American lightweight recorded his 16th straight professional victory. Soo battered Curry with an avalanche of blows in the eighth and final round of their bout and the fans clamored for a knockout but the beaten scrapper wouldn't go down. This was a real "Pier 6 brawl" all the way as both fighters threw caution to the winds and tossed leather with the rapidity of a machinegun. Often Curry caught Soo with clean rights and the latter was just as efficient with wicked hooks.